Osyka, a small town on the Mississippi-Louisiana border, was once a center of the timber and cotton industries. Though small in number, the Jewish community of Osyka left a lasting legacy. The name Osyka stems from a Choctaw word meaning "soaring eagle." Located in Pike County, Osyka became a major town for three reasons: the cotton gin, the cotton warehouse, and the railroad. The town was founded on land owned by Jesse Redmond and John Carter in 1854 after news spread that the railroad was headed their way. Osyka was chartered on November 3, 1858, at which point there was already a Jewish population. About fifty Jewish families came to Osyka after the railway reached the town in August of 1854. Jews came from Prussia, Germany, Alsace, and Bavaria, escaping persecution and troubles following the revolutions of 1848. They brought with them the vocational skills and money necessary to begin a new life. Jewish families in Osyka set up businesses as merchants, sales clerks, horse traders, and a wheelwright. They built the first school, bakery, butcher shop, and barber shop in Osyka. Their synagogue was the first religious organization in Osyka, predating the first churches by two years. The churches, one Episcopal, the other Presbyterian, were not founded until 1859. In the 1860s, the Osyka synagogue was housed in the Wolf Family home on the corner of Second and Liberty streets. Sam Wolf came to Osyka from Alsace and became a cotton merchant. His daughter, Delphine, married one of the Keiffer brothers, who owned a prominent shoe company in New Orleans. Another of Sam’s daughters, Fanny, married Eugene Frank, another Alsatian immigrant from New Orleans, who fled Europe to avoid military impressment in the 1870s Franco-Prussian War. Fanny became disabled and totally deaf in early adulthood but learned to carry a cane and read lip movements. She went on to lead a very active public life. Despite their foreign origins, Jews were prominent members of the civic and social life of Osyka. They served as alderman on the town council and in other important civic posts. In the 1880s, a group of Jews joined the local Masonic orders and Lions’ Club. On June 4, 1877, Meyer Wolf helped organize the Hancock Democratic Club of Osyka. In 1894, Jews were even involved at the First Baptist Church, as Leonard Cahn was featured in their production of “Mordecai,” possibly a story relating to the Jewish holiday of Purim. Despite the turmoil of war, Jewish businesses thrived in the late 19th century. “Buggies and Sundries” and Wolf & Cerf are just two examples of the businesses which existed in southern Pike County in the late 1800s. Lehman and Leopold opened a butcher shop, and gained a reputation by sounding a “Cutrer” bell to announce the arrival of fresh meat deliveries. The bell was first used as a plantation bell on the farm of Isaac Cutrer to signal dinner time. Max Heuman edited a local paper, the Osyka Herald. Other Jews were horse traders and clerks. Many Osyka Jewish residents were interred in a German cemetery located off US Highway 51. John Jacob Bergold formed the cemetery in 1860s. Today it contains around twenty-seven Jewish gravestones, many of which belong to the Jews who died during the 1878 Yellow Fever Epidemic. Several Jews were killed during that epidemic, including Lehman Dreyfus, May and Susan Hart, Isaac Heuman, and Henry and Myer Wolf. After 21-year-old Adolph Cahn died from the epidemic in 1878, his wife and child went back to Germany. In 1933, their descendants fled Germany and moved to what was then Palestine. At the turn of the 20th century, many Osyka Jews left for New Orleans and Baton Rouge. The synagogue and the local German school closed by 1900, although some Jewish businesses still existed in Osyka as late as 1910. Osyka’s economy experienced changes as a result of the yellow fever epidemic, the extension of the railroad away from the area, and the destruction the boll weevil caused to the cotton industry. The local saw mill also closed around this time. 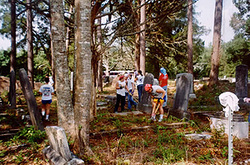 "Restoring Osyka’s Jewish Cemetery," Southern Jewish Life, December 28, 2011. "The Times learns that on Monday last the quiet town of Osyka was thrown into a state of excitement by the murder of a young man named Marcus Myers, a quiet, inoffensive gentleman, beloved by his companions and acquaintances. The report brought is that he was killed by Charles H. Allen, the agent for the New Orleans, Jackson and Great Northern Railroad, and the friends of the deceased characterize it as "a wanton and cold act of murder," without any just provocation." On Tuesday a coroner's Inquest was held by Justices Bickham and Traube, and after hearing the testimony the accused was committed to jail without bail. The deceased was cut down in the prime of life, and was suddenly called to meet death. His remains have arrived in this city for Interment. It appears that previous to the homicidal meeting there had been a difficulty between Mr. Myers and a nephew of Mr. Allen. The latter had, in fact, been assaulted by Mr. Myers two or three times. On the day upon which the homicide took place, the nephew, working in the same office with Mr. Allen, reported the affair to him. Thereupon, Mr. Alien went into the streets to make some inquiry into the matter, but did not at any time go in search of Mr. Myers. The meeting took place near the store of Myers, and near this Mr. Alien had been standing in a conversation with some friends. While Mr. Allen was thus occupied, Mr. Myers came and stood upon the steps of his store. Mr. Allen then said to him: "I suppose you feel as though you are large enough to whip me?" Myers replied: "I had just as life fight yon anybody else." He thereupon drew his pistol, and the firing commenced between them. The first shot was fired by Mr. Myers. He then retreated to his store and was followed up by Mr. Allen. It was then that the homicide was committed. The whole difficulty occupied less time than it takes to make the narration. Mr. Allen, the accused, is a gentleman highly connected, and has been well known as an employee of the Jackson railroad for the last fifteen years." To “teach the young idea how to shoot” by moral and religious training, could and ought to be accomplished by all parents who have the material interest of their children at heart, and who realize the beneficial results that will emanate therefrom. A city or town that is not able to maintain a 'stationary minister' cannot well support a 'traveling one.' The question suggests itself, why not then devote the Sabbath exclusively to prayer and holy convocation? It meets with this ready response; that business will not permit it. 'Consistency thou art a jewel,' but when and where if this 'consistency' developed? Why a minister, when the most sacred day for holy convocation and prayer is broken and disregarded? The questions propounded are suggestive themselves and need a reply." Gilbert, June. “Bits and Pieces: More info on old cemetery.” Enterprise-Journal. Apr. 22, 1992. Leman, Bernard. “The Samuel Wolf Family of Osyka, Mississippi.” Courtesy of the Manuscripts Department, Tulane University Libraries. Osyka Mississippi File. Institute of Southern Jewish Life Archives. Lowenstein, Jacob. Email to Bevil Hamilton. August 16, 1987. “Osyka.” The American Israelite. March 7, 1877. Reports of Brigadier General Albert L. Lee, U. S. Army, commanding Cavalry Division. Baton Rouge, LA. October 9, 1864. http://ehistory.osu.edu/books/official-records/083/0881. Accessed May 5, 2015. Varnado, Lucy (Wall). Osyka: A Memorial History: 1812-1978 (Osyka, 1978).